According to the National Institutes of Health, approximately 10 million Americans are currently suffering from TMJ problems. TMJ stands for temporomandibular joint, and this is the small set of hinges that connect your lower jaw to the rest of your skull. Like other joints in the body, it can develop strain and inflammation that can lead to pain in the jaw, head, neck, and shoulders. Why Choose MayFair Dental Associates for TMJ Therapy? TMJ issues can stem for many sources, but the most common tend to be stress, chronic teeth grinding (bruxism), and a misaligned bite. These can lead to stiffness and tension in the joint as well as the surrounding muscles and ligaments, and this can easily turn into pain that radiates throughout the head and neck. 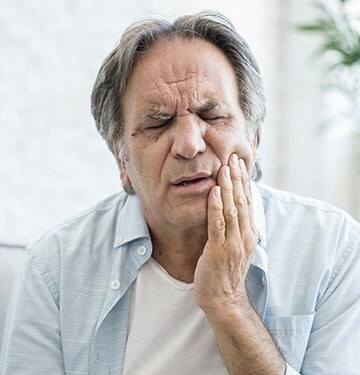 Once a patient reports or exhibits problems with their TMJ, the next step is to figure out what is specifically causing the issue, and this will help us put together the appropriate treatment plan. 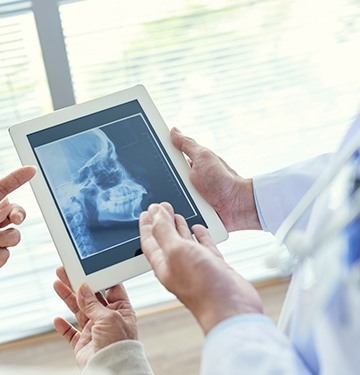 Our team will perform a number of mobility tests on the jaw as well as take multiple scans and X-rays of the joint. When the root of the issue is confirmed, then we can get started on fixing it. If a misaligned bite is to blame for a patient’s TMJ issues, this means that the teeth are not coming together properly, preventing the muscles in the jaw and face from ever fully relaxing. To correct this, we simply need to reshape a few teeth in order to balance the bite. To do this, we only need to remove a few millimeters of enamel from specific teeth to ensure that the top and bottom rows fit together correctly. Or, we can use something called an occlusal splint, which is a therapeutic mouthpiece a patient only has to wear to bed. These slightly adjust the jaw into a more natural position, helping the muscles relax and heal themselves. They can also prevent another common side effect of TMJ problems—nocturnal teeth grinding—by placing a barrier between the rows of teeth. After a few months of consistent use, the jaw should “learn” to stay in this new position, enabling a patient to go throughout their day symptom-free. If any of the symptoms we listed above sound familiar, know that our team is ready and able to help. We have the answers and treatments you need, so contact us today to schedule an appointment. We know you’ll be glad you did.